Measles used to be a common childhood disease. Pretty much everyone got it, meaning about 4 million cases per year. The vast majority got it as children, meaning between toddler and teen. Then the measles vaccine came on the market. Although it was arguably the single most effective vaccine, its longevity and efficacy was unproven. A 2011 outbreak in Quebec, where herd immunity SHOULD have protected everyone (over 95% of children had at least 1 MMR dose, and 90% had two) caused the largest measles epidemic in North America in a decade - over 700 cases (this link is from PubMed - https://www.ncbi.nlm.nih.gov/pubmed/23264672). 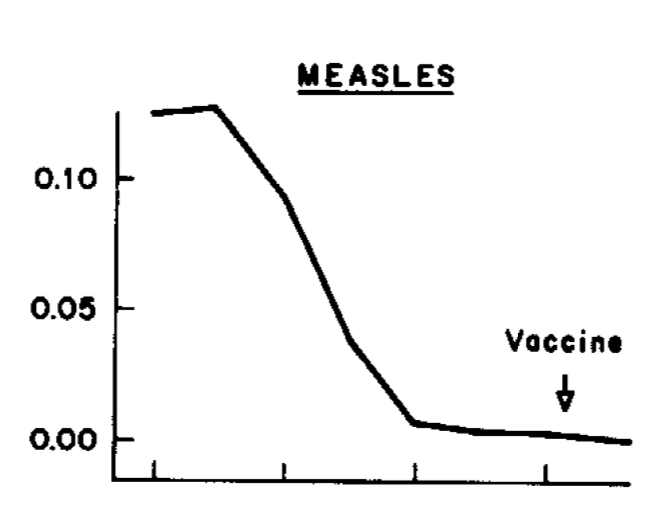 What the MMR did, in addition to giving immunity to measles to some 85% of those receiving it, was shift the average age of disease. Instead of measles being a childhood disease primarily, you now have adults, pregnant women, and infants contracting it - a much more serious situation. We also have the side effects of the MMR, which some will choose to deny, others to minimize, and still others to ignore. HOWEVER, and this is the kicker, this is pretty much irreversible. Even if the MMR was a bad idea, and I think it was well-intentioned but a big mistake, it has now become the most logical course of action. Prior to the introduction of the MMR, if your child had measles, you could safely assume that no adults were at risk, and taking reasonable precautions could minimize the chance of spreading it to infants, whom were at higher risk from the virus. You could assume that it would be treated properly, and that fatalities and serious injuries from the virus were rare. Additionally, perhaps for the above reasons, the mortality rate from measles is apparently HIGHER nowadays. While before the MMR the CDC said the rate was 1 out of 10,000 (see link above), now the numbers they publish are 1 or more out of 1,000. Whether this is a scare tactic, because of a different age group getting it, or we've collectively forgotten how to treat rubeola, that means that 2019 is NOT a good year to get the measles. Although it stinks, and the risk of adverse events from the vaccine is real, unless you have a good way to ensure that your child and ONLY your child gets natural measles, the MMR is the best option. Do we know how many children sustained vision or hearing loss when measles was routine? Also, when fewer mothers were breadwinners, the economic repercussions of staying home as the virus went through the family was lessened. where does the CDC say currently mortality from measles is 1/1000 currently? What the correlation between the 2019 measles outbreak and not knowing how to treat Rubeola - those seem to be two different ideas? where does the CDC say currently mortality from measles is 1/1000 currently? What the correlation between the 2019 measles outbreak and not knowing how to treat rubella - those seem to be two different ideas? That's what it seems to be in other developed countries. Also, I think that you meant to say rubeola rather than rubella which doesn't require treatment. Rubeola is measles. It’s not Rubella. I guess I'm really not into these "we are still right, the medical world screwed up, but lets vaccinate anyway" type posts. There would be fewer cases of measles right now in all affected cities if people vaccinated their children. Complications from measles (did we ever know how to treat it?) should still be a concern for parents. In order for something to be of interest to the public, there would have to be some sort of motivation. For example, after a grandchild spent a nightmarish week in the PICU from RSV a couple of years ago, I would like to see the vaccine made more available. Obviously mankind is interested in alleviating illness and suffering or we would not be seeing pharmacies, urgent care centers, podiatrists, chiropractors, health food stores, etc everywhere we look. There would be no health department because sickness would not be viewed negatively. the MMR was never "a bad idea"
what on earth is "natural measles"? This is so well said. It is a sad reality and I just wish that the hatred would stop for a moment and for people to realized what is happening here. To recap, the vaccine causes more harm than good according to the anti Vaxxers. Some agree somewhat, some are in denial and some are choosing to dig their head in the sand. Study after study shows side effects. The question is not if it does, the question is do we have a choice. However, at this point in history, we have no choice but to vaccinate everyone and make sure to stop the spread of measles. Fast forward 2025, and we will be facing a similar situation to the measles. It may be dangerous for a pregnant woman or immunocompromised individual to catch the chicken pox so any child who will have chicken pox will need to be isolated. Vaccines only create temporary immunity so todays teens, the ones who received the varicella vaccine, will not be fully immune in a few years when they are pregnant and it will be dangerous for them be around kids who have the chicken pox. Anyone refusing the varicella shot will be considered a rodef and rightfully so. There is currently an outbreak on a US navy ship that is not allowed to dock. There was a 100% vaccination rate and over half the sailors on board came down with mumps. Mumps past puberty can potentially cause Sterility in males but there is nobody to blame for this outbreak but scientists failure to foresee the future as they didn’t realize that they are not HAshem and can’t eradicate a disease. I know you are annoyed at angry at the current outbreak. If you take a moment to calm down and think clearly enough to read your post and match it up with scientific evidence, it would be nice. Are you aware that scientists are currently experimenting using the measles virus to treat a specific type of cancer? We all have an achrayus to vaccinate our kids now but we may admit that this was a manmade disaster. There is currently an outbreak on a US navy ship that is not allowed to dock. There was a 100% vaccination rate and over half the sailors on board came down with mumps ... they didn’t realize that they are not HAshem and can’t eradicate a disease. An article dated Mar. 29 says "As of Saturday, 27 sailors and Marines aboard the dock landing ship USS Fort McHenry have been diagnosed with parotitis, which the Navy described in a statement earlier this month as a 'viral infection which has symptoms similar to mumps.'" and that all 700 sailors have since been given a MMR booster. Do you have a link to an article about over 300 additional sailors having been infected to make it "over half the sailors"
BTW, while surely Hashem allowed this to happen, smallpox has been eradicated. OP can't be 1000% correct. Calm down - we're not currently experiencing a disaster. You do realize that the scientists are modifying the virus in these studies? They use the virus's transport mechanisms to get into the cells, specifically into the DNA of the cells, but they modify them in a way to avoid the dangers of it. Came to post this. I believe the goal is to do the same for other diseases, though some are easier to deal with than others for a variety of reasons. Relevance? Amother Ivory, I'd prefer to let her actually spell out her argument before responding to it rather than guess what it is. I'm curious if you read through that entire paper that you're touting as evidence? You stated 95% had at least 1 MMR does, and 90% had two. As you can clearly see, the majority of patients were either unvaccinated, or received only 1 dose, or had no known proof. Additionally, the abstract clearly spells out "Among adolescents, 22% had received 2 vaccine doses". So I'm curious where you got your numbers from? You will clearly see how the severity of the disease lessened with the vaccination status. Take the adolescent of 12-17 - 30 of the unvaccinated patients ended up in the hospital vs 1 with one dose, 2 with 2 doses and 1 with unknown proof. This conclusion of this paper wasn't to discount the MMR at all. It was to point out the if we want to eliminate measles, we need a tighter herd immunity status than what we have now, and we need to evaluate the residual vulnerability that is still in existence with the vaccine. Their conclusion points to the direction that we should look to attain greater herd immunity status and to see how we can strengthen the MMR vaccine to reduce the residual vulnerability. And polio has been eradicated in all but two countries, Afghanistan and Pakistan, I believe. There are health workers who have risked their lives to get to this point. Most sane post I have read in awhile. Thank you.